As part of JUMP’s ongoing initiative to reach out to those who have served in Japan, our very own Suzy Wagner sat down with Becky Cederholm to gather her perspectives on her time abroad. Becky’s husband Colonel Mike Cederholm, has been selected to become will be General Commander VMFA212. 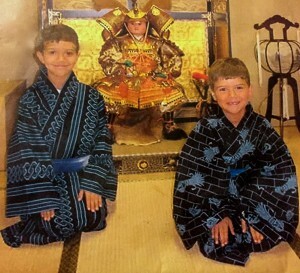 The Cederholm family lived in Japan from 2005-2007. What brought you to Japan and where did you live while you were there? At the time, my husband was an F-18 Marine Corps fighter jet pilot. We lived in Iwakuni, Japan, which is on the mainland about an hour from Hiroshima. You had 5 young kids when you lived in Japan. What advice do you have for families who are selected to live abroad? Live where you are. Don’t long for where you’ve been. Wherever you end up, wherever you are – you can benefit from being where you in that place and learning as much as you can about the country and the people. In our country we are connected by television, the internet and a massive highway system. Even if you’ve never been to the West Coast, you have an idea of what it looks like – not so in Japan. This helps communities like Iwakuni preserve their character. No one passes through. Where we lived in Iwakuni, there aren’t many military, it’s very provincial. People were very curious about us. They wanted to take our picture, touch us, and practice English. We didn’t speak much Japanese, but they were very gracious. They wanted to speak English and take me places. Did you mostly stay on base? Or did you get to know many Japanese people? My husband’s job was very demanding; he was commander of the air station. With his role, we had a lot of social obligations. I remember once, a Japanese gentleman came up to Mike and gave him a scrapbook of pictures of him flying. We were so touched by his thoughtfulness. People in Japan really did reach out us. They invited us to lunch and invited our kids to play. Speaking of kids, what were some of your impressions about children in Japan? Our kids were aged 6 to 16 years old. We took them to do lots of things – sporting events, touring. I remember the first time we showed up for a baseball game or soccer game off of the base. The entire field was dirt. It was very different for us. The Japanese thought it was sort of a waste to grow grass where kids were going to play. There is this great sense of safety in Japan that gives children a lot of freedom, it made it hard to come back to the United States. In Japan, you’d see little kids taking the city bus to school. Little kindergartners would be taking the bus by themselves. To cross the street you’d put your hand up like hailing a cab and just cross the street. Everyone would stop and let you go. From a daily living perspective, what had a big impact on you? I’ve heard recycling is really intense. There’s a lot of people sharing a little space. There are at least nine different types of recycling and if you don’t do it right, they don’t take it. There are pictures and instructions on everything. A cereal box is one type of recycling. A can for tuna is a different type. Everything has to be clean before it’s put in to recycling. There was an Officers Club on the air station. Most Friday nights, we’d all get together and at 8:00am Saturday morning you’d hear an enormous crash of recycling. They actually handed out ear protection to protect from the boom of recycling. If they didn’t hand out ear protection, you could’ve sued! It’s funny that you mention that. In Japan, there is no such thing as “suing each other.” Think about in the U.S, if you have an accident or something bad happens, the first thing that we do is deny responsibility. In Japan, it’s the complete opposite, you put on your best clothing, you go and publically apologize to the family and you offer some kind of financial compensation. Everyone has the responsibility to do the right thing. You admit your wrong. They accept your apology and you move on. Think about the impact on culture. That sounds pretty great. Any final thoughts? Would you go back? I would visit. I would live there again – but the distance away from family is hard. We were really there at the perfect time. It was a great experience.